I’m reading an amazing non-fiction book right now. 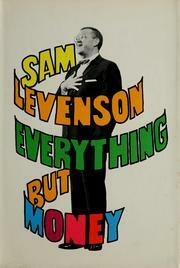 It’s called “Everything But Money,” by Sam Levenson, and it was first published in 1949. The edition I’m holding is the fourteenth printing, published in 1966, and it contains mentions of events as recent as 1965, so it must have been updated as it was reprinted. The book is in four parts. In Part 1 the author (who was born in 1911) describes his childhood in the poorest slums of Brooklyn, NY. His parents were Jewish immigrants, I think from Russia or thereabouts, and they had eight kids altogether while barely managing to stave off starvation under conditions of the most abject poverty. Although “abject” might not be the right word: his parents never saw a lack of money as any kind of excuse to fail in life, and they put a great deal of effort into their children’s education and moral guidance. The author grew up in a family that was financially destitute but very rich in love and support. Because of this, he and his seven siblings all overcame the poverty of their childhood and became successful in their adult lives. In Part 2 the author talks about how different the experience of family life and parenting his own children is in the environment of middle class affluence and national prosperity of the 1950’s and ’60’s. He wonders if in some ways the benefits of “the good life” are actually detrimental to the healthy development of the younger generations. He talks about the ways in which society is failing those generations. By modern (2012) standards, the America he lives in sounds impossibly sane and prosperous, a sad reminder of how far we’ve fallen since those post-WWII glory days. It leaves the reader with the wistful sense that if more people had thought the way he did things might have gotten better instead of worse. Part 3 is basically a personal monologue describing the author’s own outlook on society in general and parenting in particular. I don’t know what Part 4 is about, because I haven’t gotten there yet. But Part 3 keeps blowing my mind in the best possible way. I’d like to share some excerpts from it here, over the next few days, because I think in these modern times those philosophies and values are more relevant than ever. I believe that each newborn child arrives on earth with a message to deliver to mankind. Clenched in his little fist is some particle of yet unrevealed truth, some missing clue, which may solve the enigma of man’s destiny. He has a limited amount of time to fulfill his mission and he will never get a second chance — nor will we. He may be our last hope. He must be treated as top sacred. In a cosmos in which all things appear to have a meaning, what is his meaning? We who are older and presumably wiser must find the key to unlock the secret he carries within himself. The lock cannot be forced. Our mission is to exercise the kind of loving care which will prompt the child to open his fist and offer up his truth, his individuality, the irreducible atom of his self. We must provide the kind of environment in which the child will joyfully deliver his message through complete self-fulfillment. When he is born we give him a public name. This provides only tentative identification until he finds his own true name, his potential at birth so completely realized that he and his work and his name become one. To have lived without having “made a name for himself” is virtually to have died at birth. We cannot allow him to be born a VIP and to die anonymously, often ignominiously. We cannot afford the loss of a single soul. We have already lost too many. I’ll post more as I get the chance. Meanwhile, the book is currently out of print but you can read it online here for free.